Truly an amazing seasonal drink, this Pumpkin Spice Latte Recipe is a real treat at just 1 Point per serving! Creamy, pumpkin-y and everything you’d expect, and it still has the whipped cream. I love the popular coffee shop version, but I’d rather save myself the $$ and the extra Points, as Starbucks’ Pumpkin Spice Latte Recipe has about 300 calories and 11 g of fat, making it 8 Points. Yikes. 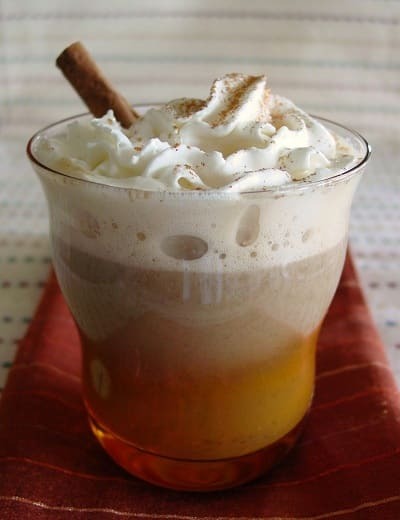 This is a great drink to serve at your favorite fall holiday party, or to just enjoy yourself at anytime of the year! Treat yourself to a low calorie version of Starbucks Pumpkin Spice Latte, and indulge in the fabulous flavors of fall for just 1 Point. It’s the perfect low calorie holiday latte recipe to enjoy this season! In a blender puree the canned pumpkin, Coffee-mate, Almond Breeze, pumpkin pie spice and vanilla. Pour into a small saucepan and cook over low heat until the milk is warm and begins to froth slightly. (About 4-5 minutes.) Remove from heat. For each serving: Pour 1/2 cup of the pumpkin milk mixture into your coffee mug and 1 cup of brewed coffee. Top each cup with ¼ cup Reddi-wip. I’m drinking this now. My goodness. I also added one packet f Splenda to the mixture as it was heating. I also didn’t use a blender because I hate washing dishes. Ha ha. It’s so good I am drinking the entire thing. :-) and tonight I’m making the cauliflower “fried rice.” It’s a LaaLoosh day!! Made this tonight as an alternative to hot cocoa. It was really good. I added a packed of Splenda to my second cup just to make it a little sweeter. This looks delicious. Do you include the pumpkin puree in with the milk mixture when cooking it?